Topics: Alberta Views Magazine, & Faceb. It is hosted by Telus Communications Inc (British Columbia, Vancouver,) using Apache/1 web server. 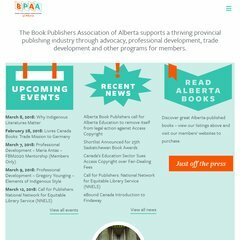 Bookpublishers.ab.ca's IP address is 209.89.49.226. PING (209.89.49.226) 56(84) bytes of data. A time of 86.9 ms, is recorded in a ping test.